No person may ride a bicycle or non-motorized vehicle upon any sidewalk or other pedestrian way within the retail zone of the congested district of the City as defined by SMC 16A.04.010 and SMC 16A.04.020, provided that nothing contained herein shall be construed to prohibit the riding of a bicycle or non-motorized vehicle upon any sidewalk or other pedestrian way within any area other than the retail zone of the congested district of the City. Here's a map showing the retail zone as described in the municipal code. And here is the number of citations issued since 2009 enforcing this law. I work downtown and I see people riding on the sidewalk every day, less so during the winter. 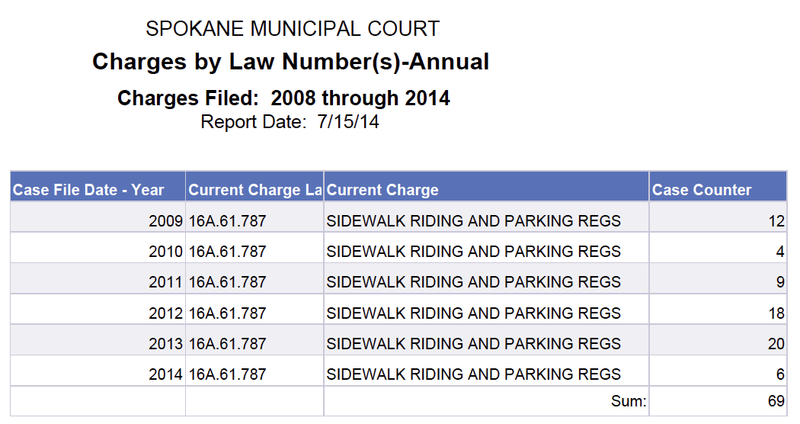 I know one person was seriously injured by a downtown sidewalk cyclist back in 1995. Given the number of bikes on the sidewalk compared to the number of citations, I have to question the need for this law.